The girls all have something in common, but what is it? What crime has brought them here from the city? Who is the mysterious security company responsible for this desolate place with its brutal rules, its total isolation from the contemporary world? Doing hard labour under a sweltering sun, the prisoners soon learn what links them: in each girl's past is a sexual scandal with a powerful man. They pray for rescue - but when the food starts running out it becomes clear that the jailers have also become the jailed. The girls can only rescue themselves. FIVE OF THE BEST: Readers voted The Natural Way of Things into ABC TV's The Book Club Five of the Best for 2015. SYDNEY MORNING HERALD / THE AGE: Kerryn Goldsworthy's review. SYDNEY REVIEW OF BOOKS: Rosemary Sorensen's incisive, rigorous review of The Natural Way of Things. 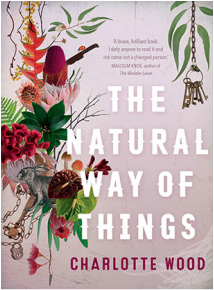 THE SATURDAY PAPER: The Natural Way of Things reviewed here. BOOKS & ARTS DAILY: Kate Evans interviewed me for the Radio National program here. A longer version was broadcast on BooksPlus here. DEVOTED ECLECTIC: Writer Elizabeth Lhuede reviews The Natural Way of Things on her blog. THE WEEKEND AUSTRALIAN: Literary editor Stephen Romei on The Natural Way of Things. The Natural Way of Things here. Winner, 2016 Indie Book of the Year Award. Winner, Fiction Book of the Year, 2016 Indie Book Awards. ​Shortlisted, 2016 Miles Franklin Literary Award. Shortlisted, 2016 Victorian Premier's Literary Awards. Shortlisted, 2016 Barbara Jefferis Award. Shortlisted, 2016 Queensland Literary Award for Fiction. Shortlisted, 2016 ABA Nielsen BookData Booksellers Choice Award. Winner, Reader's Choice, 2016 ABIA Literary Fiction Book of the Year. "At once brutal and beautiful ... Surreal yet intensely vivid, the novel is disturbing and enthralling .. An absorbing plot, lyrical prose, and discomfiting imagery makes Wood's novel decidedly gripping." "A work that will haunt the reader with its poetry and the stark truths buried within Wood’s brilliant exploration of a toxic culture in extremis." " Bold, provocative, startling and thoughtful, The Natural Way of Things is what fiction should be." "A unique and hypnotising work ... an unforgettable story. Wood is a gifted and inventive writer whose characters shock and surprise. Five stars."